You are here: Home > Programmatic Search – is it a “thing”? Reproduced with kind permission from IAB Ireland member, iProspect. “Programmatic Search: What it is, What it isn’t, What it will be” by Bartley Sharkey was first published on the 12th of June 2015 on the iProspect Blog. Programmatic advertising allows you to be significantly more selective about who exactly you show your ads to regardless of where that may be. Whereas the existing model allows you to target ads to specific user groups based on the site, much like choosing one newspaper to buy ad space in versus another, programmatic buying gives you the ability to further refine your targeting by choosing to show ads to some people on a particular site and not to others. Big deal. Well actually it is, we’re already one step beyond the realm of what’s possible with our physical paper alternative and we’re just getting started. The way you decide who to show your ads to depends on a number of factors, like what they’ve been doing on the web until now, their demographics and quite importantly, what you’re willing to pay to show your ads to the most qualified eyeballs. Now we’re getting somewhere – once I figured that programmatic buying involved bids and auctions, my natural inclination was to join the dots and assume that it’s just the same thing as search – we already have bids, we already have auctions so voila – programmatic search! Right? Wrong. Let me first consider the similarities between programmatic display and more specifically Real Time Bidding with paid search. Then I’ll take a look at the differences. Real Time Bidding has caused quite a stir since it was first introduced about five years ago. In the past couple of years, it has really shifted up a gear to become a more efficient way of buying display impressions accounting for approximately 30% of digital ad spend. At its most basic, it turns the display advertising process into an auction based not only on the site (publisher) where the ad will be shown but also on a wealth of data collected about the user being targeted. Advertisers can choose who they are most willing to pay to show ads to and how much they are willing to fork out. The main difference in this auction versus the auction we get from paid search is that there is no ranking, you either show or you don’t. It’s position one or nada, so you don’t even get the benefit of reducing costs by targeting lower positions. I’m more interested in search and what it all means for my chosen discipline. Paid Search has always been based on an auction, keywords are (at least should be) as targeted as you can get and the bidding begins every single time someone searches on your keywords. It strikes me that search is already using Real Time Bidding but just hasn’t been calling it that. Could it be that display is simply catching up with paid search? If so, then what has taken it so long?! 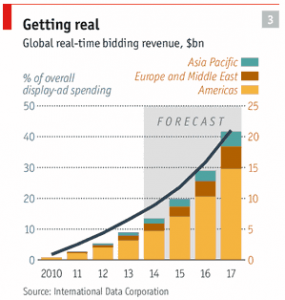 Now for an important distinction, Real Time Bidding is not the same as Programmatic. Yes, it’s a form of programmatic advertising, but it isn’t the full story. 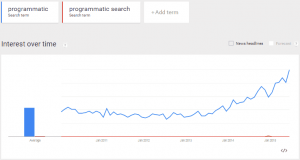 Is programmatic search a “thing”? Perhaps programmatic search is an oxymoron; the channel is a safe haven for those that distrust display because of the sheer array of possibilities and the added layers of complexity it brings with post-click, post-view impressions, clicks and conversions. Now there’s the issue of viewability to contend with, which in many ways has put the cat among the pigeons, giving easy ammo to the doubters. With these complexities, it’s easy to see why automated systems are needed to help advertisers and publishers make ads work. Not so with paid search. It’s clean cut, easily understood and you only pay when a real person takes a physical action by clicking on your ad. Not only that but the range of publishers is typically one, Google, and has been for at least the past decade. That said, what would programmatic search look like if it were to be launched as such? To begin with, there would be many more layers of targeting applicable to your ads; keywords would be a starting point but there wouldn’t be any more exact match – we’re after the right audience, typos and all. You’d get demo targeting options as well as behavioural targeting options, just as you do with display. Furthermore, you’d need a sliding scale of potential bids based on how well a given user matches your “ideal customer” criteria. These are all developments that Google will release in the coming months and years but therein lies the crux of the programmatic search question. In order for it to be truly programmatic, it should be deliverable on a massive range of publishers not just on Google, not just through AdWords. People’s online behaviour will inevitably get more fragmented. As more and more digital natives get plugged in, the entire concept of “Googling” something will become antiquated as they spend more time on other platforms and sites like YouTube, Facebook, Instagram or the next big thing we don’t even know exists yet. Perhaps Bing and Yahoo will make a comeback, being the resilient underdogs can’t go on forever. As these other sites occupy more and more of people’s lives, they have a massive opportunity to monetise very quickly with a tried and tested format – paid search ads. As the landscape evolves, who’s going to manage all those different PPC ad engines? Some will try to keep up, others will turn to automation and as the process continues, automation will win out. Welcome to Programmatic Search. 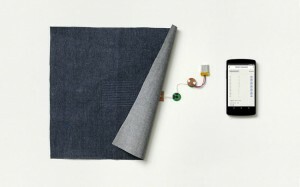 Technology continues to race forward as if perfection is just around the corner. Google recently came out with their touch and gesture sensitive clothing range called Project Jacquard, another big innovation that they’re going to pioneer and parade to the world before they figure out how to actually make money from it. I think we are at the early stages of a technology convergence, having seen the many options of what direction we could go in, we are collectively consolidating our preferences and ditching anything that doesn’t make the grade. What that means is that our preferences are becoming so well defined that we’ll eventually see everything we could want under one roof – search, social, video, etc. Even ads will be customised to such an extent that we’ll be bidding not just for the audience but for the ad format we want to show on every web page out there. What happens when PCs are gone and people don’t realise they are interacting with the Internet at all? They tell the TV to show the weather and it just does it, no options to click, no options to book a sun holiday…or is there? Programmatic search is here, to a degree, but it’s a far cry from what we’ve come to recognise as programmatic display advertising. I think that will have to change and when it does, the need for consolidation will outweigh the need for more and more specialised experts in each area. As I often like to remind myself, the only constant is change.